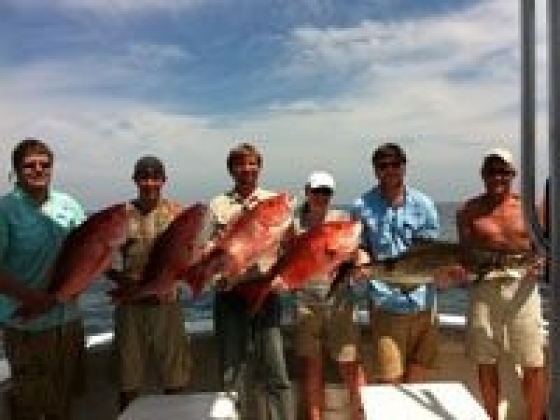 Red Eye Charters is a full service,Gulf Shores fishing charter offering half or full day charters specializing in bottom fishing, trolling, and Tuna fishing. We can accommodate 1 to 6 people. We are seasonally located in picturesque Fort Morgan, Alabama at the Gulf Shores Yacht Club & Marina and in Venice, Louisiana. Captain Gary Bryant has consistently proven his abilities as a top notch charter captain. Whether you are looking for a relaxing fishing experience or a serious challenge, Red Eye Charters can more than satisfy your needs. 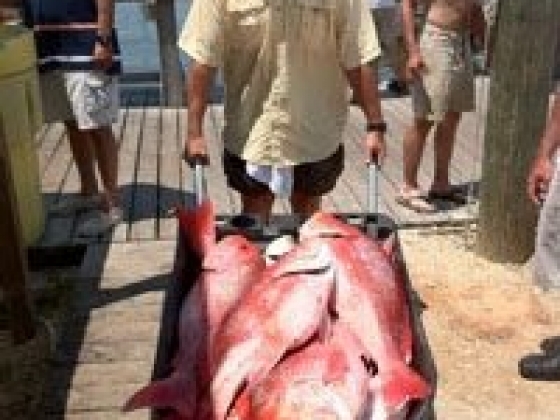 From April through November, the Red Eye is docked in Fort Morgan at Gulf Shores Yacht Club & Marina where we specialize in Gulf Shores fishing charters catching fish around hundreds of oil rigs and artificial reefs in our area. We target Red Snapper, King Mackerel, Cobia, Grouper, Amberjack, Tuna, Wahoo, and Marlin. The only limit to the fishing possibilities is the length of fishing trip you choose. Available trip lengths are 4 hrs, 5 hrs, 6 hrs, 8 hrs, 10 hrs, 12 hrs, and overnight. We are also available for fishing rodeos and tournaments. The Red Eye is a 1982 36' Topaz that is continually being upgraded. She has been given all new paint, tower, rails, motors, transmissions, props, and shafts. The interior was also entirely redone. THIS IS A BOAT THAT BEGS TO BE FISHED! She has a proven hull that can take whatever the Gulf throws her way and has all of the amenities to keep you fishing in style and comfort. Some of the features of the Red Eye are: Heated and Air Conditioned Cabin Shower Microwave C/D Player Lots of Comfortable Seating Fast Cruise Speed From December through March, the Red Eye is docked at Venice Marina in Venice, Louisiana. 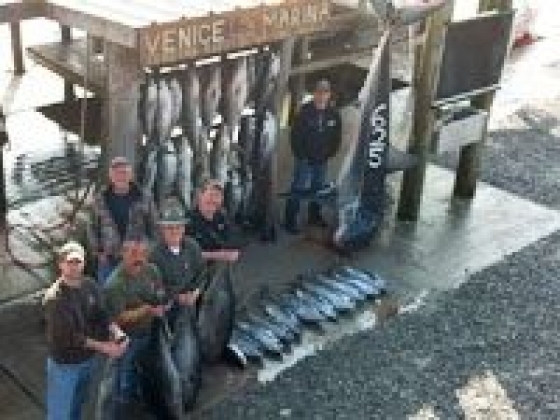 The waters off the Louisiana coast offer Tuna and Wahoo fishing at its best. Each winter, Tuna and Wahoo school up off the mouth of the Mississippi River on many of the underwater salt domes. Fishing here can truly be unbelievable. Every trip has the possibility of being the trip of your life. We also offer overnight trips to the offshore oil rigs. These trips give you more time and fish catching options, for the ultimate trip try a two night charter to Green Canyon. In fishing terms the Green Canyon offshore rigs are truely the gulfs land of milk and honey.